You will find us in the Bohemian neighborhood of Malasaña, in a building from the beginning of the last century. Come up to the first floor and see our 120m² open space plenty of light, designed to inspire. See our 2 zones. In the first area, three balconies overlooking Carranza Street, a small and charming green house and the sofas area. In the second area, the main one, a flexible space for work tables that can be adapted to your own needs. We will assist you to create the best assembly posible for your meeting (imperial assembly, theater, cocktail, school ...) and we will provide you with plans of the space and the capacities of each assembly. You will find all the necessary tools you might need for your session: audiovisual equipment, whiteboard ... Should you need anything specific, do not hesitate to ask us. We will find it for you. When we eat, we relax and improve the environment. 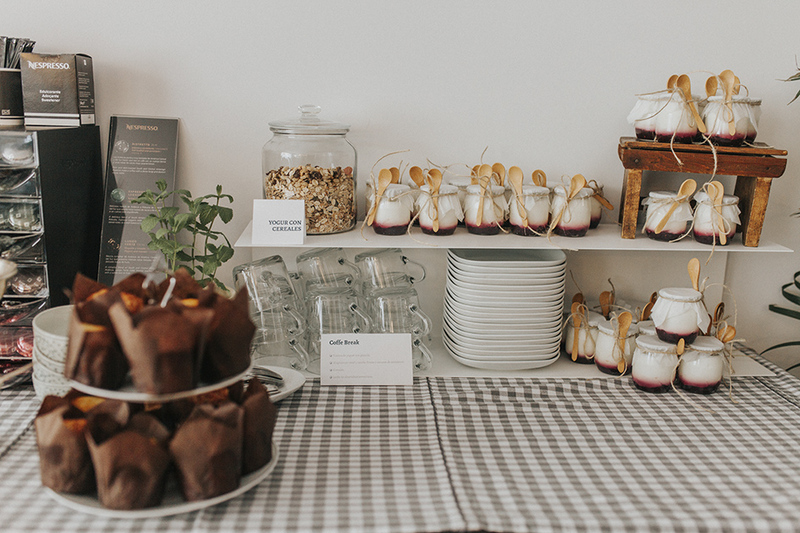 We can offer you different catering options, healthy and verygood: breakfasts, brunch, lunch ... Let us know what’s in your mind and we will arrange it.